This is a card I made for a challenge over at Victoria Case. It is using her free image, Willy the Worm and the challenge sketch. I'm trying to figure out how to use copic markers. They are wonderful to work with but will take practice. I have a lot of fun news to report. My Making Memories finally arrived in the mail and there I am on page 68. Yikes. While having my LO in the mag is totally cool I cringed a little when it was one featuring my old mug right there front and center. LOL. I was a little surprised about the journalling as I was asked to include it all and the thrust of the article was to be "new beginnings- overcoming adversity" but none of the text was printed. It was a great issue this month and I'll be sad to see Memory Makers go. I've been asked to be a full-time Bombshell Girl and I accepted. I think my love for Shannon's images is pretty well-known and continuing to work with Bombshell Stamps is an amazing opportunity for me. So expect to see a lot more Bombshell love in the future. I finally tried out digital stamps last night. I decided to give the Bollywood set by Sandra Dry a whirl. It is a big challenge coloring open line art and I have a lot of room to grow in my skills. That said, I thought the images were decent enough to make into a note card set - what do you think? Hair is KILLER! You just have a general hair shape and have to draw in all the texture and sections yourself. Yikes! Happy Birthday, Johanna. Wishing you a wonderful year full of creativity and unexpected joy! P.S. I used my Stampamajig for the first time today and I don't know how I lived without it. It's so much better than "eyeballing" and we;; worth the four bucks I spent. Love it! One of the more interesting challenges at the VSN was, "tying the knot". You were required to make a card based on this picture and you had to include a knot - either with ribbon or thread. My problem was that I forgot I needed a knot. So after I was done I added a tie closure to the card and an inside white panel for writing. It worked out well but I hate adding things in after the fact. Note: I saw someone put fabric - or paper that looks like fabric - under this image and I can't for the life of me remember who to give credit to. My process of elimination leans towards Claudette, but to whomever you are - thanks! In personal news, I've started physical therapy again and it's KILLING ME!!!! Actually, it's a very good thing but my back is very unhappy with this decision. Hopefully this will get me back on my feet ASAP. This weekend is the virtual stamp night at Split Coast Stampers and I was able to participate in a few of the challenges. I am all done with my May 2009 issue of Cards and I'd like to pass it on :-) Leave a comment on this post between now and Monday letting me know which set of Bombshell Stamps is your fave and I'll draw one of you to win this luscious mag. You can see all the different sets here. Yesterday I spent a significant portion of my day dealing with my medical issues and I really felt like God cleared my path. I called my doc's cell very early in the morning and cried. He got me an appointment first thing and moved me to the front of the waiting crowd. When walking in I noticed my physical therapist was in his office. He's a prof at the U so he's only at the clinic on evenings and weekends. I popped in to see him after my Dr. visit and he had an hour to spare because it was finals and he didn't need to be at the U. So I got an instant appointment with him too. After a thorough exam we have a new treatment plan and until Monday I'm being "actively restful". All that time in waiting rooms gave me a chance to have some quiet reflection and I came to some very happy conclusions. I've always been a creative person: music and dance when I was a kid, writing through my teens and adulthood and arts and crafts now. In writing especially there is a concept of filling your cup. The idea is that you can't write great stories unless you are filling your cup with movies, plays, novels, trips, adventures, new sights, sounds, smells, tastes, new people. You need all those experiences to draw from and subsequently pour into your work. Scrapbooking and card making (for me) is very much the same. By reading blogs, magazines, books, taking classes etc. you fill up your creative reservoir so when the time comes to make something the inspiration is practically overflowing. This is my month to be the guest designer at Bombshell Stamps. I'm such a lover of Bombshell Stamps that getting to design for Shannon and be counted among the amazingly talented ladies on her team is a huge honor. The stamp I used on this card is Man's Ruin. I made it for my step-father who has had more than his share of trouble with women and liquor. I think he'll find it hysterical. How did I do keeping it boy-friendly? This was also my first coloring attempt with markers. They're fast, fun and unforgiving. LOL. I haven't forgot my promise to post a bunch of money-saving tips for scrapping this week. My camera is being extremely persnickety - for example, I made a tutorial and it only saved two of the forty or so pics I took - so it's been challenging. I'm pumped! I'm psyched! I'm just raring to go! This is going to be a great week. Not having the flu is like being reborn. If you look at the bottom of the picture you can see soot and smoke damage as this picture was saved from our house fire in 1997 - talk about distressing a photo! I have some more good news to share this afternoon. I'm just waiting for some decent light to take a few pictures and then I'll be back. It's far from a secret - in fact, if you look around this page of my blog you can probably figure it out. See you in a few hours - now go sign up for the free class! So... do you guys like my food posts or are they boring to the average omnivore? I am asked so often what we eat that posting about it seems natural. Please let me know. What did we eat for dinner? Before I tell you let me pass on a rule we have in our house. If you cook something new (aka WEIRD) then you must provide dessert or something really, really good in case it's a disaster and everyone hates it and subsequently starves. Chickpea Cutlets with a "not beef" shallot and red wine gravy I invented. It was darn good. In fact I'd bathe in it if I could. Do you ever feel like your efforts as chief cook and bottle washer are unappreciated? I have in the past - especially when everyone just eats, offering no "thank you" or even, "this is good". No one really cared about the hours I put in at the stove - SLAVING - and at times that got to me. Since I've started taking pictures of some of our meals I've felt very validated. Everyone elses work gets rewarded and recorded, now mine is too. Plus, if I pull out the camera attitudes shift to, "look at the special thing mom did for us." Which is a heck of a lot better than, "Where's the grub?" Tammy asked me to be the Guest Designer for May at The Scraproom! Now I'm sure you ladies all know of my great and unending love for all things TSR - it was a huge honor to get to play with the kit. You can see the design team ideas, mine included here. I hope you check them out. For my card-making friends, there are a lot of card samples at the bottom of the ideas page. I thought it might be fun to do a series next week pointing out all the sneaky money-saving tricks I employed on each of the layouts. So be sure to check back often so you don't miss anything. Need a teaser to get the inspiration to click that link? 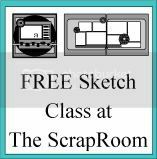 Did you know all month long Susan is teaching a sketch class at TSR - and it's FREE! My kind of pricing. You have to sign up for the message board (also free) to participate and there are PRIZES!!!!!! There are ten sketches so roughly a new one every three days. Each sketch is used by a variety of guest designers so there will be lots of pages to drool over and lift ideas from. Hope you pop in.